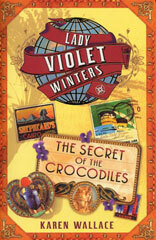 You'll have to sail up the Nile from Cairo to Luxor if you want to join Lady Violet Winters while she solves this particular little secret of the crocodiles. Violet smiled to herself. Madame Poisson was the perfect governess. She was always either indisposed or asleep. Violet called her her 'dear codfish' because she looked just like one. Amelie Poisson had silver-grey skin, a full lower lip and the popping-out eyes of a codfish. They even had whiskers in common! Violet stared into the almost colourless eyes of a blond-haired man. She had taken an instant dislike to him at the beginning of the voyage, though she couldn't explain why. It was more of an instinctive reaction. His manners were impeccable, but there was a coldness about him that made it seem as if he was only playing a part. Violet wondered if this was what was called love at first sight. The monkey was the size of a small toy teddy bear, with brown stripes down his cheeks and big, bright eyes. His fur was dark on his back and light on his stomach. Fixed into his ear was a small turquoise stud. She's smart, Lady Violet, she can sort this little matter out in the twinkling of an eye. Read it for yourself and see. An enjoyable bit of a romp in historical costume with lots of modern day attitude.